This is a post by Rachel Carpenter (@bothgirl). 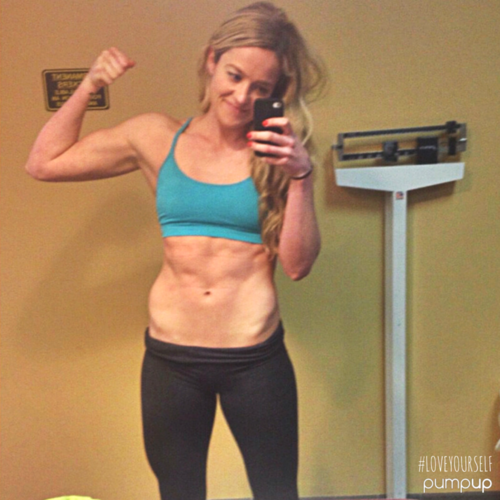 Check out her blog for her daily workouts! So your fitness goal is to “tone up”. I think what you meant to say is that you want to increase your muscle size and lower your body-fat percentage so that you appear to have more muscle definition. Cameron Diaz isn’t “toned”. She has developed her muscles and eats a clean diet for a low body-fat percentage so that those muscles can actually be seen. You see - there is no such thing as toning, and I’m going to explain to you why. I hear from one girl after another, telling me that they “don’t want to get big”that they “just wants to tone”. This has always frustrated me, because I know that a musclecan only get bigger or smaller. It’s not a shape shifter. Unfortunately, the media has marketed the toning myth to us for quite some time – but it’s not too late to get educated on the facts. Shall we have a short lesson in anatomy? Our muscles are anatomically confined to the space between our joints and our bones. They cannot get longer; they have a starting point and an ending point. Between those two points the muscle can only grow bigger or smaller. It can’t change its shape. The misconception surrounding toning beings with the myth that doing light weight and high reps will result in lower body fat and increased muscle. This is essentially cardio, and all this really means is that it’s going to take you a heck of a lot longer to grow that muscle that you want to see. This is also why so many people struggle to see progress. The biggest offenders of this “toning” fad are the barre or ballet type classes, as well as Pilates. Don’t get me wrong, there are benefits to both of these types of exercises, but they claim to give you “long, lean muscles”, which is anatomically impossible. By participating in these types of exercises, with the hope of “toning”, you’re just building your muscles more slowly than you would if you were strength training with heavier weights. You might achieve other benefits, but this is the hard way to get a lower body fat percentage. I’d love to stop hearing the word “toned” – and I’d love to see a lot more women in the weight room. Don’t take my word for it. Find someone, like Cameron Diaz, who you want to look like and find out what they are doing. Chances are, they aren’t “toning” or practicing magical spells to get those results. Remember to avoid the fads and stick to the facts…and don’t be afraid of heavy weights.